I met Jay Z last night. He's one of maybe five famous people I've ever wanted to meet and I've wanted it to happen for 20 years and it happened. I shook his hand and talked to him and you know what? It was the second best part of my night. 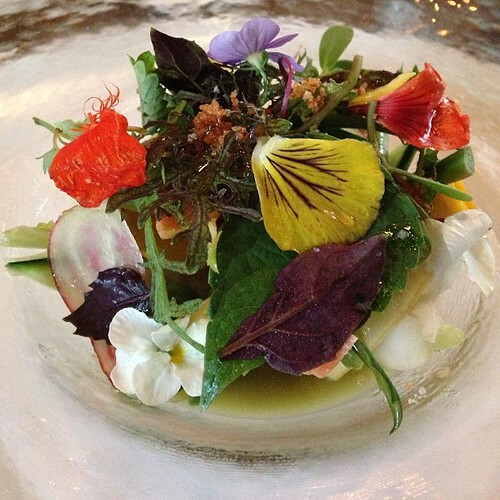 Jay Z was bested by a plate of glossy vegetables garnished with edible flowers. And a fistful of pork belly. 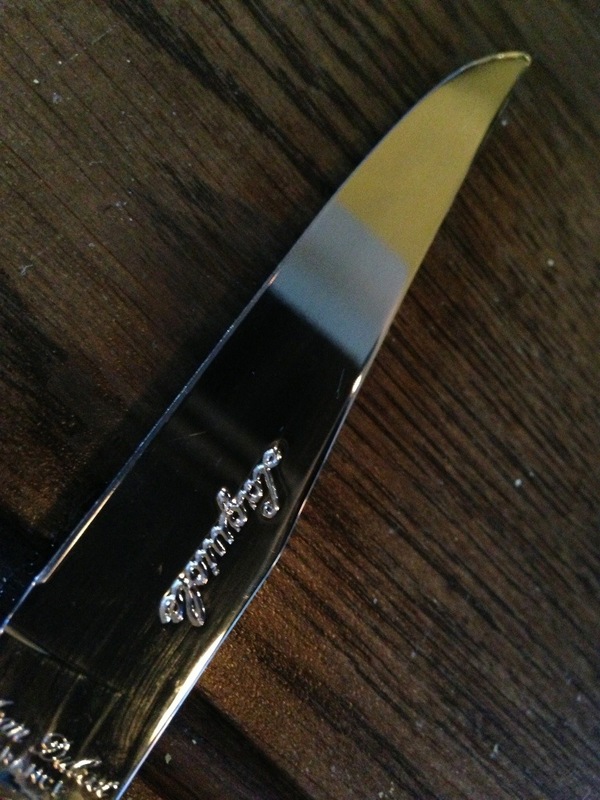 And lavishly attentive service. 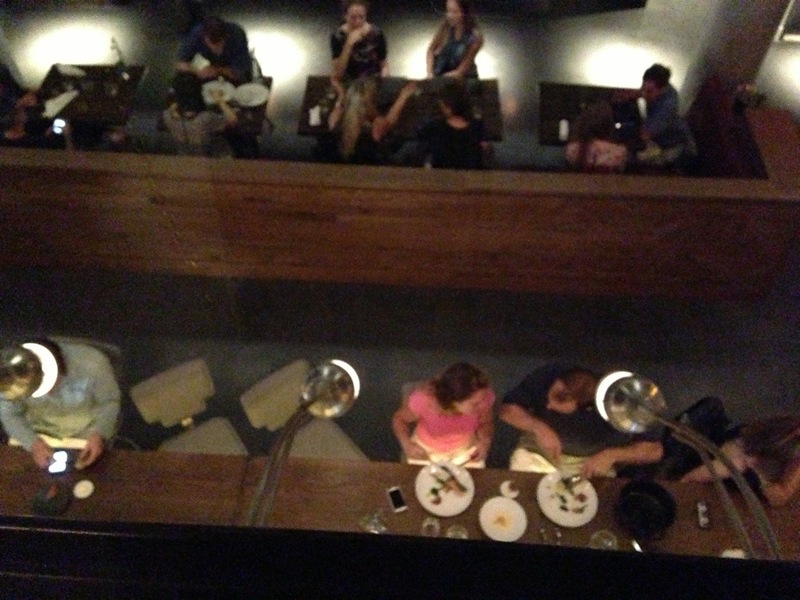 Because a couple of hours before I met HOV, I was sitting downstairs at Chef Paul Liebrandt's brand new restaurant The Elm inside the King and Grove Hotel in Williamsburg (Brooklyn) and it was already one of the best nights of my food-filled life. I went with a dear friend and business contact from Mosefund Mangalitsa farm, which provides all the exquisite pork we use for Midnight Brunch. Chef Liebrandt, who is my favorite chef in the world, uses Mosefund's pork in a few dishes on the menu, so my friend invited me to join her to check it out.We intended just to taste a couple of things but wound up tasting more than a few since Chef was there and his team kept sending nibbles over. The dishes I'm sharing here are ones anyone can order off the current dinner menu and I recommend that you do so quickly and often. I started with lobster because it's summertime and I would wear a lobster bikini if I thought it wasn't a waste to do such a thing. 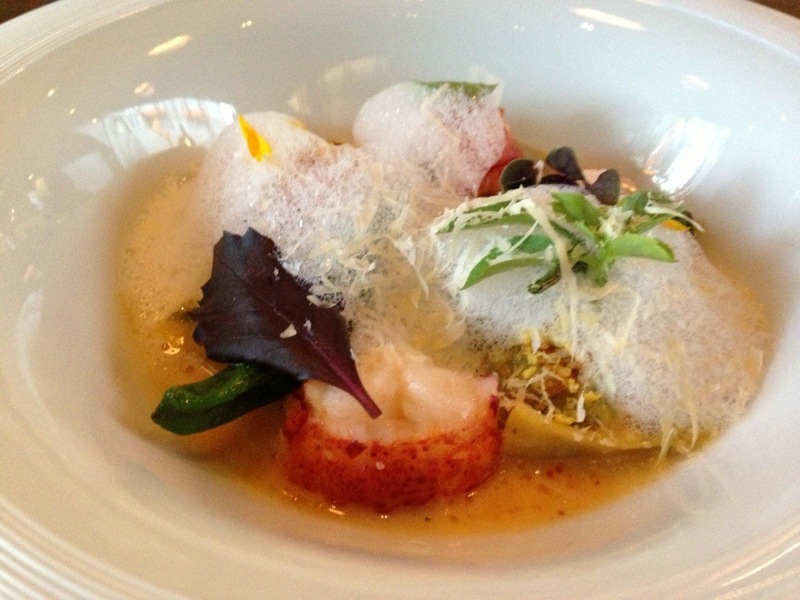 This ish right here is Swiss Chard Agnolotti with Lobster, Corn and Shishito Pepper. The agnolotti is a beautiful pillowy little pasta pocket and I'm sorry you can't see it in this photo because it's napping under a cloud of foam. 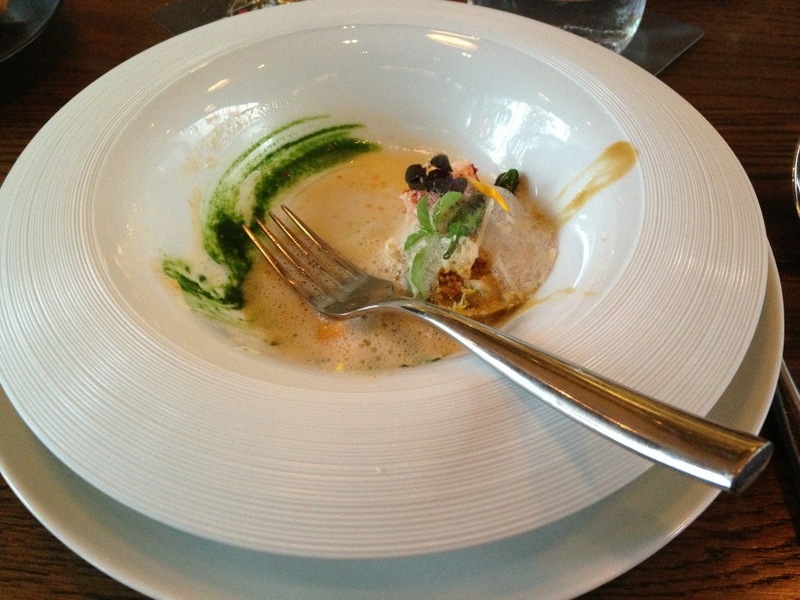 The foam and other tantalizing visual and textural employs of molecular gastronomy are hallmarks of Liebrandt's cuisine. I first had his food at a private dinner he did for Epicurious in 2009 and quickly started paying close attention to his work in NYC. We also enjoyed a bowl of chilled avocado soup that came with curry-scented cashews , shrimp and radishes. I now want to add diaphanous discs of radish to everything involving avocado for the rest of forever. No pictures because I was too busy enjoying a tequila and mezcal cocktail and my friend was eating it like it was going somewhere. I have to pause here and share another Liebrandt story. I closed a big deal at my old company and as a thank you, the president said he would take me to dinner at any restaurant I wanted. I was dying to go to Corton where Liebrandt made his mark in NYC (and which he just recently left). I knew my boss would at least have fun looking at the food whether he liked eating it or not. The meal is #19 on this list (pic). When our main course arrived last night, it reminded me of that night at Corton in the best way because I was again getting to experience Liebrandt's food with someone who'd never had it before. The way he plays with color and weight and chemistry in cuisine is nothing short of spiritual. It is the definition of experience. 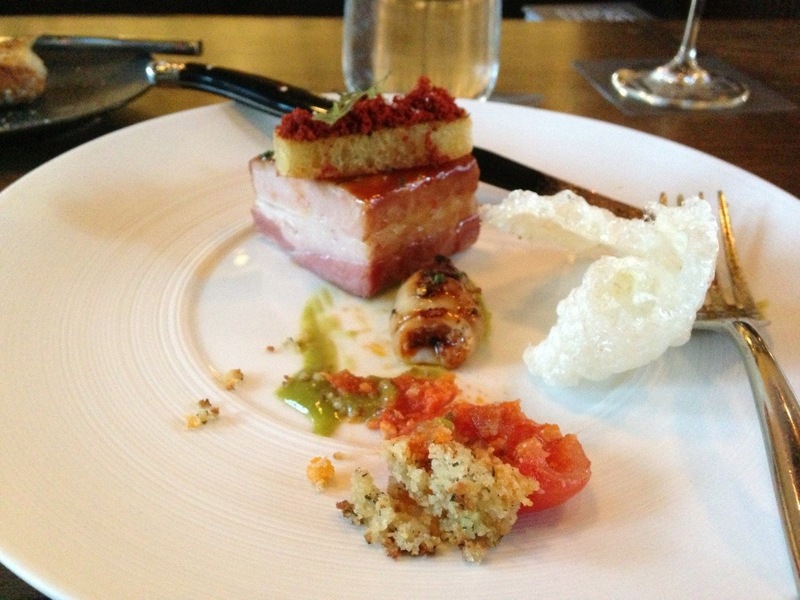 So, here is the pork belly. 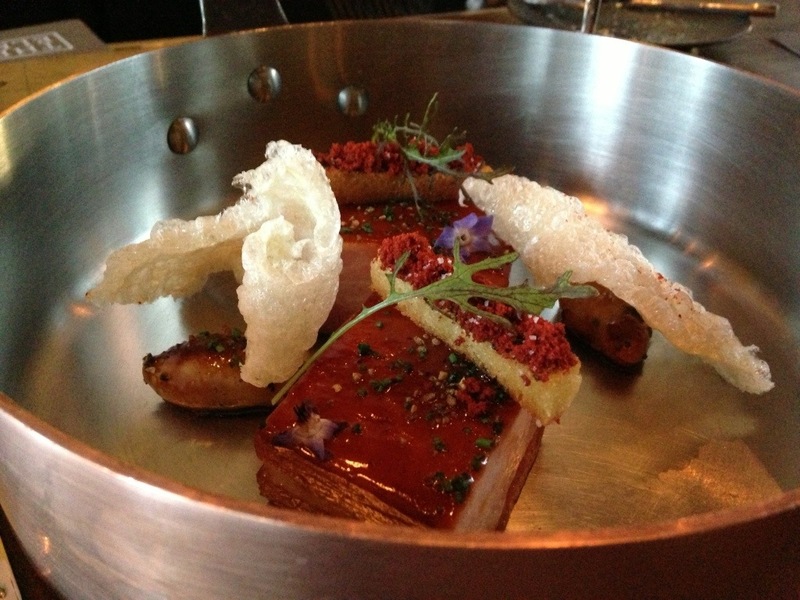 It's a shared plate so that's two servings (about 3 ounces each) of unctuous pork belly served in a copper saucier, garnished with slender slices of shortbread topped with a tomato and paprika jam and chicharrones. Off to the side under the chicharrones, you'll see stuffed baby squid who nobly gave their lives so they could be jam-packed with my friend's delightfully fatty Mangalitsa pork and olives and the devil knows what else. This is the pretty "before" shot. And here's the "after" photo. Just kidding. I totally ate all of mine. I don't want to talk about it - let me have a private moment. Dessert, y'all. This was sent over after we refused the crazy attractive cheese plate and waved away the dessert menu. I didn't even want to look at the menu because I was afraid something like this might happen. 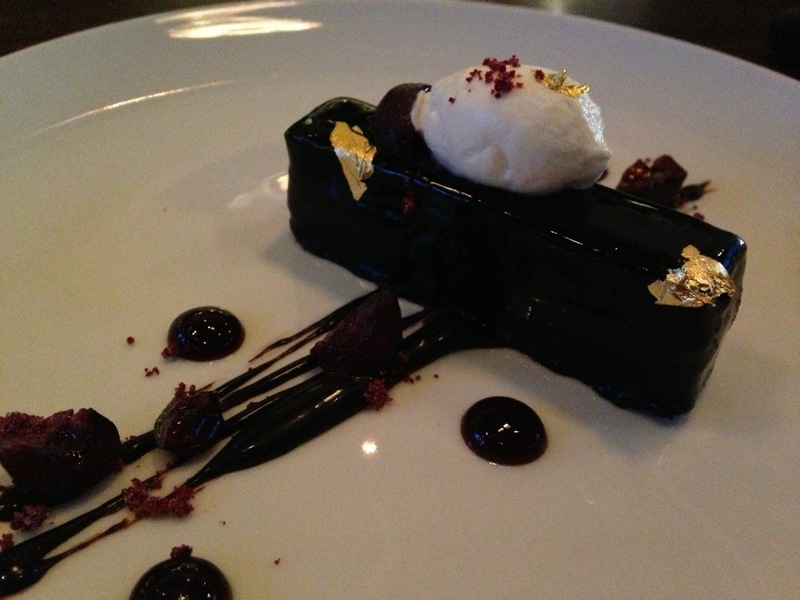 Gold flecked German chocolate brownie creamy oh my God just stop it. Sitting at the bar may get you laid. Very, very laid as you can see the whole floor of the restaurant reflected at you from a one-way mirror in front of you. Rawr. Ok, so just go. Check out the menus here. My friend shared a pic yesterday of some insane lobster benedict breakfast situation and I can't breathe anymore. Just go eat there immediately. I have to go back and have the everything else on the menu and drink the other drinks I haven't drank yet. Keep scrolling for a money shot. 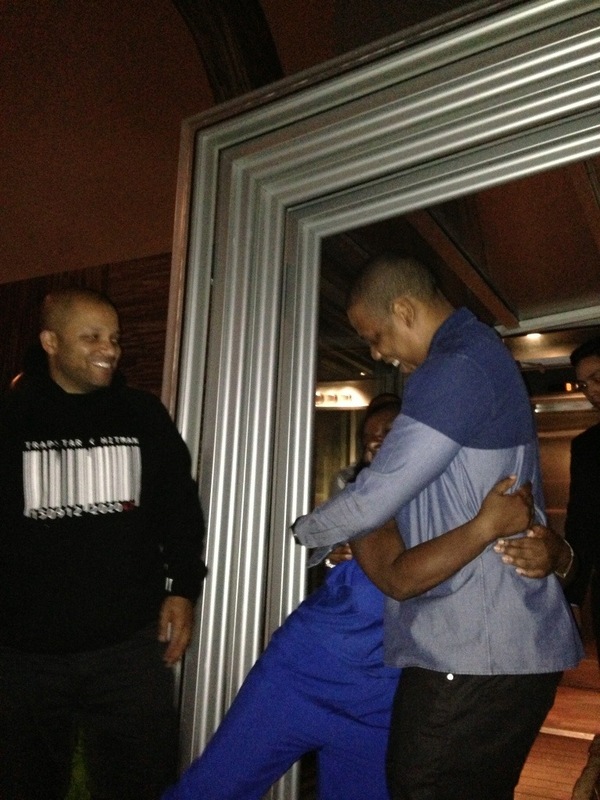 There's Jay Z, hugging on his friend at her birthday party. Nice to meet you, Jigga! I love sharing details about upcoming tasty trips and adventures, so you won't want to miss a bite. As always, please feel free to chat with me on Twitter, join our group on Facebook and keep up with new posts here by subscribing. 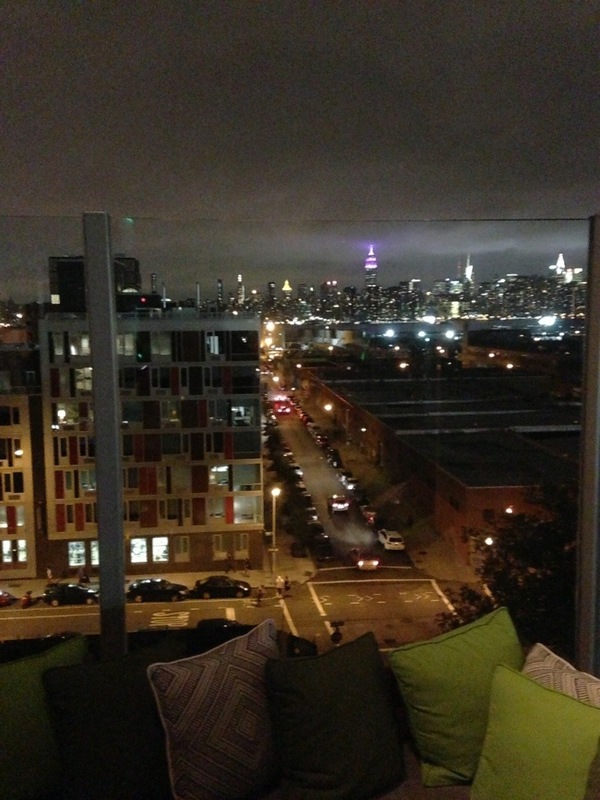 Request an invite to future Midnight Brunch events here (next event is in October). This week brings us the summer solstice. Despite our wacky temperature swings in NYC as of late, we can no longer deny that summer is here and it is ready to PARTY! 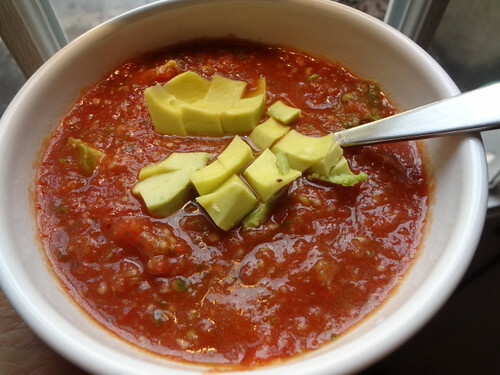 To celebrate the occassion, I have a post up on KitchenAid's new blog where I show you how to make a summer favorite: Gazpacho! Here's a sneak peek: Today, we’re showing you how to get macho with gazpacho, a chilled tomato soup that’s Spanish by birth but can easily be made into your own signature dish with a few tweaks. This is a refreshing summer appetizer that’s perfect for parties and using a KitchenAid® Hand Blender makes it a snap to whip up. Get the full recipe and a step-by-step photo tutorial on the KitchenAid blog.